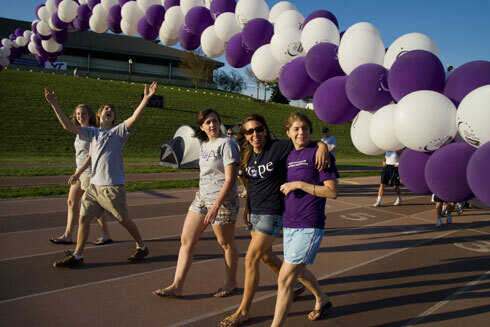 The 2010 Relay For Life at Virginia Tech is set for April 9. BLACKSBURG, Va., March 30, 2010 – The Virginia Tech Relay for Life will take place on the university's Drillfield April 9. The Virginia Tech Relay for Life team is busy preparing for the final event of a year-long fundraising effort for the American Cancer Society. Virginia Tech Relay For Life has already registered more than 550 teams and more than 4,600 participants for the April 9 event. It has raised $235,000, making it the number one university in the nation so far. The Virginia Tech Relay Executive Committee is still actively rallying support and encouraging the community to register for the ninth annual Virginia Tech Relay for Life. The 2009 Virginia Tech Relay for Life was the largest collegiate relay in the world, based on money raised per participant. An incredible $507,000 was contributed to the American Cancer Society. The Relay Executive Committee’s goal for 2010 is to raise $650,000 and recruit 6,500 participants. Virginia Tech’s 2010 Relay for Life will begin at 6 p.m. Participants will be treated to performances by live bands, talent competitions, group exercise classes, wing-eating contests, and line dancing, all while taking turns to walk or run the track. At 6 a.m., the event will conclude with an announcement of the total funds raised for the American Cancer Society. “Regardless of how successful any fundraiser or event is, we are always, always celebrating the lives we have saved, remembering lives we have lost, and fighting back against cancer for those who face it today,” said Emily Feeney, public relations executive chair for Virginia Tech Relay for Life. Feeney, a junior from Olney, Md, is a communication major in the College of Liberal Arts and Human Sciences. The Virginia Tech Relay for Life, a student-operated organization, is a division of the Student Government Association at Virginia Tech and a member of the South Atlantic Division of the American Cancer Society. The Virginia Tech Relay for Life website provides the latest updates and explains the many ways to get involved, specifically how to volunteer for the event, join a team, or donate to the cause. Written by April Baker. Baker, a junior from Fort Defiance, Va., is majoring in English in the College of Liberal Arts and Human Sciences.